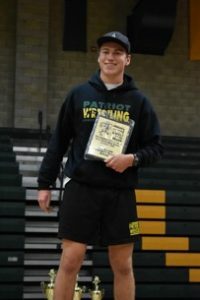 Multiple Teams · Dec 3 Wrestling Gets 2nd Place Finish! 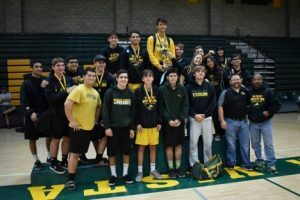 The varsity wrestling team took 2nd out of twenty teams that attended the 17th annual Bud Harbin Invitational Battle by the Beach on December 1, 2018. This was Patrick Henry’s first year attending this tournament. With only 16 participates, the team was able to have 11 medalists placing from 1st to 5th. With special mention to junior Kellen Foster, who was the recipient of the Bud Harbin Community Service Award for his accomplishments throughout our community as well as various academic and extra-curricular projects while maintaining a 4.1 GPA. Go Patriots!